The Lenovo ThinkStation S20 is a high performance Workstation built for producing breakthrough innovations in the fields of digital content creation, video rendering, business analytics and engineering. Its quad-core power can be optimized for Turbo-charged performance and greener personal supercomputing that easily beats competing models in value for money. 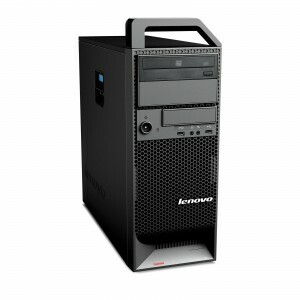 Lenovo S20 Workstation features a variety of dual and quad core Intel processors boasting up to 3.20GHz, 8MB L2 cache with its DDR3-1333 Turbo Xeon Extreme W5580 package. The Workstation optimizes all computing processes for maximum performance and efficiency with a maximum of 24GB DDR3, 1600MHz, Unbuffered SDRAM, ECC Supported RAM. Lenovo S20 also features dual NVIDIA Quadro FX 4800 or ATI FirePro V7750 cards to ensure seamless processing of graphically demanding applications. The S20 Workstation is certified and tested for performance and compatibility with major industry-specific applications. Storage options are reasonable by modern standards: 500GB of 10K and 15K SATA and SAS hard drives supporting RAID 0, 1 and 5 configurations. The 18 x 6.9 x 19 inches (HxWxD) Workstation is powered with energy efficient 625 Watt Active Power Correction supply. Lenovo is leading the Workstation industry toward a greener future by manufacturing 50 percent of the S20 Workstation with recycled material. Stocking a huge array of system components allows bargain hardware to provide you with the choices you want when configuring your refurbished Lenovo Thinkstation S20. From Quad Core and Hex Core processors to Quad Head graphics cards and SAS storage, our configure-to-order system puts you in control!